Today (November 14th) India Celebrates "Childrens Day"
Nov 14th is India's First Prime Minister Pandit Jawarhalal Nehru's birthday. He is fond of children. His love and affection is always towards children. Every year, Google is honoring the children's day by putting children's day Doodle on November 14th. This year it shows below Doodle. Varsha Gupta is a 3rd class student from Ryan International School, Greater Noida, India. 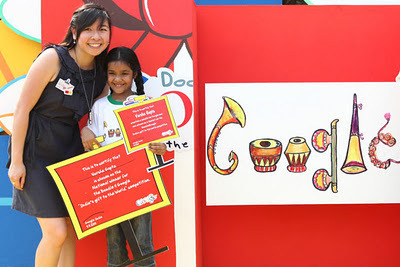 This year (2011) Google asked the kids to draw the Doodle for the Theme "India's gift to the world"
Her Theme for the Doodle is "Indian Musical Instruments". And, She gives below explanation for her Doodle. You can complete list of shortlisted Doodle here. India is a land of different cultures. In India Music plays a very importatnt role. India has given many musical instruments to the world. Example:- Tabla, Sarod, Veena, Shehnai etc. Goddess Saraswati plays Veena, God Shiv plays damaru. According to our mythlogical stories musical instruments used to be played on all the occassions. Even during war musical instruments were played. Lord Krishna's flute is known in the whole world for its magical music. In mordern days mr. Zakir Hussain is world famous as Tabla Mastro. Pandit Shiv Kumar Sharma is known as a great Santoor player all over the world. Read our knol to see the previous years Children's Day Google Doodles. wow sooooo beautiful.God bless her and Happy Children's Day.